So you might be wondering why I’m posting a craft project on here given that I have a separate blog for all things crafty but this is definitely not a child friendly craft, in fact I had horrible dreams about it the night I finished as it’s pretty scary, so I thought it would be best to post about it on here! Regular readers of my blog will know about Mr C’s latest car project and last week he said he wanted a scary doll to hang in it so we decided to make a Saw doll. I haven’t actually seen the film and have no intentions to as I stopped watching scary movies way over ten years ago. In fact the Scream movies were probably the last ones I watched. I just can’t handle anything remotely scary these days but I did think it would be fun to try and make a spooky doll so decided to give it a go. I had just finished making Cherry a knitted superhero doll so decided to do the same thing again but with some changes. 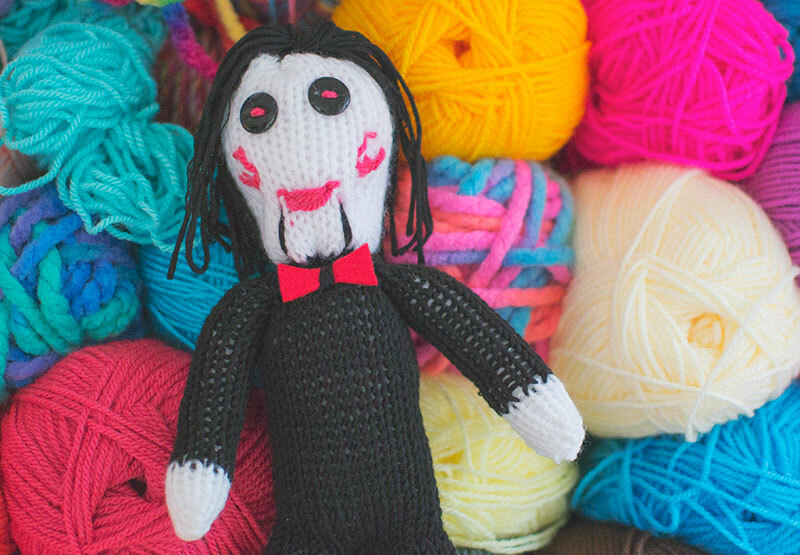 I used a pattern out of a book called Jane Bull for the superhero doll and used the same measurements for this one but you could use any knitted doll pattern as it’s just the colours and extras that turn it into a Saw doll. So for the colours of the body and head I just stuck to black and white then I added a little red bow tie make from felt. 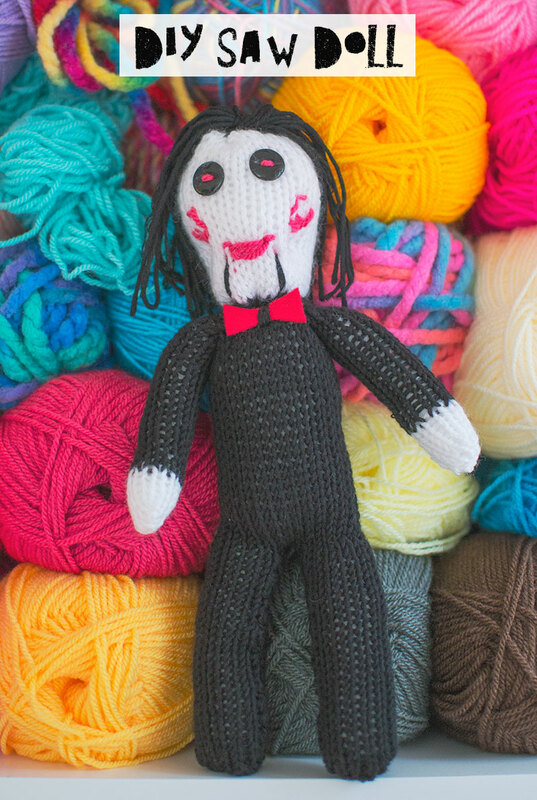 I made the hair by tying some black yarn together then stitching it on top of the head, sewed on black buttons for eyes using red yarn. Added the red spirals to the cheeks and some black yarn coming down from the mouth to create the look that the mask had. Then finally I put a stitch going across his face to try and create the definition that the mask had. I didn’t bother with a nose as I didn’t want to risk overdoing it and although it doesn’t look exactly like the mask that it’s probably a good thing as the real one looks terrifying! I’ve already had a few requests from people wanting me to make them one, I need to practice my knitting so that I get a bit quicker. I am a real beginner and this is only my second completed knitted project so you don’t need to be amazing at knitting to make one. As long as you know the knit stitch and purl stitch then that’s all you need. I think I am going to try some other horror movie characters next, let me know if you have any requests!